Read about a variety of fish that begin with the letter N, from neon Tetras to aggressive Bichirs. Nandus - Nandus nandus: More commonly known as the Gangetic leaffish, this species is native to South Asia and Indochina. They live in stagnant bodies of water like lakes, ponds, ditches, and flooded fields where they are caught for the fishkeeping trade. Needle Fin Eater - Belonophago tinanti: The Needle Fin Eater is native to the Congo Basin and Ubangi River in Africa. It is a predator, so keep it with larger fish that dwell on the bottom. They may eat smaller fish and might nip the fins of larger, mid-top dwelling fish. Needlefish - Xenentodon cancila: This is a silver, skinny fish with long jaws filled with needle-like teeth. It resides in the shallow waters of the Chesapeake Bay’s from spring through fall. 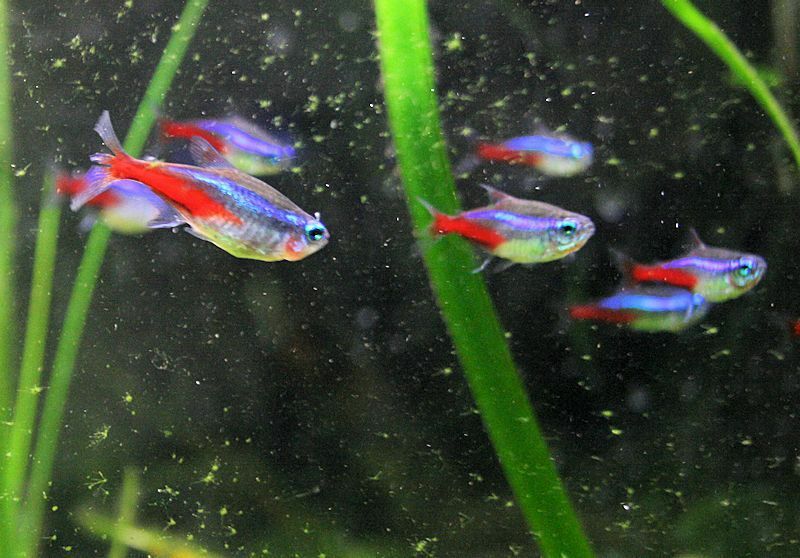 Neon Tetra - Paracheirodon innesi: The neon tetra dates back to the 1930s and is one of the oldest tropical fish in the hobby business. That's because it has gorgeous, striking iridescent colors and a peaceful personality. It makes a great tank mate for a non-aggressive community aquarium. Nicaragua Cichlid - Hypsophrys nicaraguensis: Males grow quite large, up to 10 inches, and they are territorial. They are best kept together with a mate. If you plan to keep other cichlids in the aquarium, you'll need a tank that's at least six feet long. Nichols' Mouthbrooder - Pseudocrenilabrus nicholsi: Males are striking and their red and blue color rival the body of some tetras for vividness. The color of their head actually changes based on their mood, from bright yellow to mustard. Even though they are small, this fish is quite aggressive, especially to their own species. They'll defend the area they've claimed, so it's difficult to keep them in a cichlid community. If you do keep them as a group, provide ample hiding spots for females and less dominant males. However, if they live with well-matched tank mates, they can coexist peacefully. Nigerian Red Krib - Pelvicachromis taeniatus: This cichlid is mildly territorial and best kept bonded in a pair. They live best with tank mates that are peaceful yet hearty and dwell on the mid-top. If kept with other boisterous and active fish, they can be shy. Nile Bichir - Polypterus bichir: Bichirs are essentially peaceful with other tankmates that are too large to eat. However, they will eat members of their own species, so make sure Bichir tank mates are close to the same size. Keep the tank covered tightly covered as these fellas like to escape!